With 74.2 million tons of reclaimed asphalt pavement being used each year, it’s not surprising that asphalt is America’s most recycled product — and has been for almost 25 years. 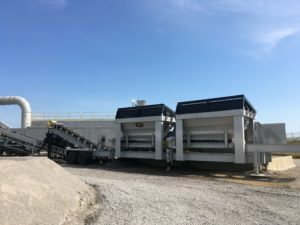 Suppliers need to ensure their RAP recycled asphalt systems are up to par for meeting growing demand as well as keeping costs low. Neglecting equipment can cause unplanned downtime and lost profits as a result of needing to use more expensive virgin aggregate. Scalping screens, lump breakers and impact crushers — key RAP components — take the brunt of system wear. Stay on top of potential problems by regularly checking for damage. Processing Equipment: Scalping screens, lump breakers and impact crushers — key RAP components — take the brunt of system wear. Stay on top of potential problems by watching screen cloth for damage or clogged openings that could result in oversized material getting into the mix and – as a result — financial penalties. In addition, regularly inspect and replace wear bars and teeth as needed on lump breakers and impact crushers to avoid inconsistent material. Weighing Devices: Regularly check weighing device calibration and performance. The wrong calibration can mean an out-of-spec completed product that may result in penalties as well as unhappy customers. Conveyors: Belting experiences more wear than any other RAP system component. Check all conveyor belting for tears, stretching, cuts, missing pieces or excessive wear. Bearings and Drives: Complete proper lubrication cycles on all bearings and drives either weekly or by hours of operation, depending on lubrication charts. Visually inspect the entire RAP system while moving through the lubrication process. Winter Shutdown: Change the oil in the reducer when preparing to end operations for the season. Clean and paint all surfaces to slow corrosion. Also, clean build-up on conveyors, chains and sprockets. Get set for success in the spring by inspecting the full machine and lubricating the bearings at that time, as well. Creating and following a regular maintenance and inspection schedule goes a long way toward reducing downtime and preventing premature wear. Talk to the RAP system manufacturer for more advice about specific recycled asphalt systems.